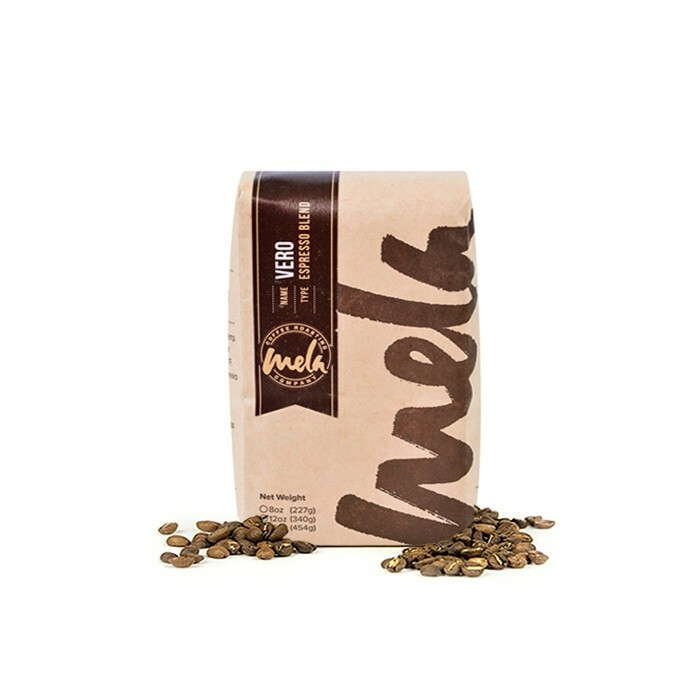 This is the Vero Espresso brought to you by Mela Coffee Roasting Company. This Fair Trade and Organic certified espresso is a combination of Sumatran and Honduran coffees. Vero is intended to be an ideal option for anyone that prefers a more traditional espresso with rich dark chocolate and baking spice notes and a syrupy, sweet body. Loved it, had some guest drink mostbofbit up so I only had two cups. Would like to try again when available. First "espresso" coffee that I've tried with my Oxo drip coffee maker (Barista Brain)- terrific coffee! Dark, smoky flavor with distinct chocolate, slight spice. I don't find it overly sweet and definitely not bitter- excellent coffee. Really enjoyed the strong and bold flavor of this coffee. Would’ve been nice if they had a little bit more caramel undertones. Overall one of my favorite dark roasts I’ve never had. One of our favorites. Very smooth with a great flavor. Would definitely like to get this again. Please continue sending similar as this, it's delicious. Bitter flavor. Not as well rounded as an oily bean. Such a beautiful flavor profile. I really loved the smoothness of this espresso, along with notes of chocolate. Made my lattes taste like s'mores! Delicious! A little too dark for my taste. Hearty, but a bit too bitter with our drip coffee maker. Would be great if I were able to make espresso, but would prefer not to buy again if I don't have the right equipment- it was too bitter. Just got an actual espresso maker so this is the first Mistobox roast I've used with that. A little on the darker side and continues to develop more smoky/bitter notes as it ages a bit. Definitely bold, and a touch of mild fruitiness. Overall this made some good espresso. This coffee was excellent! Liked it a bit more than the first, perfect blend of medium, a little fruity but still works well in the expresso machine. Usually coffee smells better than it tastes...not in this instance. So good, so smooth. Really love this coffee! I really liked these beans! They aren't citrusy or fruity so i was very happy about that. Roast level was pretty good, not too dark or light. I really like this flavor blend. It smells amazing; the chocolate and smokiness really come through. The fruitiness was a pleasant surprise. It tastes a little too burnt to me. Reminded me of Starbucks. I liked the chocolateyness of it though. Great blend for my taste. Dark, bold, balanced, and sweet. No sour or bitter after taste. The description indicates "smoky" but I did not get those notes in the tasting (thankfully). Smooth and satisfying brewed in French Press. Will also brew in Pour Over and Espresso to see how it fares in those brews. Dark chocolate notes were obvious and welcome. As my first order from Mistobox, I'm interested to see how the membership progresses! Loved the notes of oakyness . The earthy chocolate was fantastic! Definitely a great start! This dark roast does not have as rich a flavor as I would like. I typically brew french roast Barrington coffee, which is full of flavor and a dark roast. This one feels more like a starbucks, burned coffee flavor. One dimensional, not a great espresso. Not too high in acidity. Nice round chocolate body. Love it! Very smooth. I like the flavor profile. Only comment, I do like it to have a bit more crema on the top but that is if I am being picky:) This is a great coffee and I really like it. It’s very nice. I could drink every day. No complaints, but it doesn’t blow me away. I loved the toasty on this one. I wouldn't mind having more of a smoky taste in coffees as I couldn't taste much in this one. The dark chocolate taste is very prominent and at first I was not fond if it but half way through the first cup I started to enjoy it. Overall I really like this coffee. Excellent flavor for my espresso brewing, I haven't tried it in my chemex yet but I suspect it will be a little too dark and bitter for me to want to drink black like that. Since this is an espresso blend and I got solely to try and get a great tasting espresso I'm satisfied regardless of if it suits my tastes made in other ways. Espresso made from this bean is solid and deep without being syrupy. The finish falls slightly flat...thankfully it isn't a bitter finish, but the richness ends suddenly. I like this this bean but look forward to trying more! Better than Cafe Malta. Less chemical taste. I expected espresso roast to be darker like French or Italian. Maybe espresso only good when served as espresso. Really great blend. Loved the chocolate flavors. Decent espresso, but not terribly interesting. "Dark" was really the only flavor that seemed to be there. Didn't care for it. Too earthy, or as my daughter says, tastes dirty. This was very, very good, but I tend to like a little bolder, bigger flavor. However, if this is the only way to not get the burnt notes of the kinds of roasts found at Starbuks then it is fine for my purposes. Has a little sour note at the end that I associate with lighter roasts. It’s pretty good, but I’m not in love with that sour note. Delicious. Great Crema and solid flavor when used as an espresso! Very good cup of expresso but would not recommend as a regular brew. I used a percolator and it was just OK. When I made it in the espresso machine it was very bold full bodied and I could taste chocolate. Very enjoyable. Interested in something even less sweet. The Dilano Special Dark Blend looks good. Smokey and Spicy, the taste evolves nicely with milk and again with temperature to give very different flavors. This one was good, I enjoyed it! Best coffee you sent me so far! Absolutely my favorite. The description says smokey, chocolate and bold - that is pretty accurate. Not perfect, my ideal coffee might have just as little more smoke and less chocolate, but very close. Still not as deep or flavorful as the first selection I was sent. This coffee produced a nice shot with a wonderful aroma. The crema was not as good as others I have received. Packaging may be improved to true vaccum instead of a simple bag. Not as good as the Intelligentsia. Smooth, but not bold. With stronger coffee, I add milk. I enjoyed this one black. Makes a great Espresso. Would give 4 ½ stars if I could. Great crema, bold flavor, and no bitterness. Sweet and smoky notes make a great balance. This was both rich and sweet with a little smoke. I wasn’t able to pick up on any of the spices of sweetness, but it’s a good solid coffee. We loved this one... so smooth, even after a week or two! Really liked this one. The chocolate notes were just the right level, in comparison to the other flavors. This is a wonderful traditional espresso. It's very middle ground in color, aroma, and flavor. It it very smooth and I am really enjoying it. I love the tiny hint of sweet and then the smoky finish. very nice. great crema, smooth flavor but bold enough. I would give 4.5 stars if half stars were allowed. Good general flavor, but nothing too special.